One of the required courses I have to take at ITP is Applications of Interactive Telecommunications Technology, taught by Red Burns, the founder and chair of the program. This introductory class is designed to allow students to engage in a critical dialogue with leaders drawn from the artistic, non-profit and commercial sectors of the new media field, and to learn the value of collaborative projects by undertaking group presentations in response to issues raised by the guest speakers. Interactive media projects and approaches to the design of new media applications are presented weekly; students are thus exposed to both commercial as well as mission-driven applications by the actual designers and creators of these innovative and experimental projects. By way of this process, all first year students will, for the first and only time in their ITP experience, be together in one room at one time, and will, as a community, encounter, and respond to, the challenges posed by the invited guests. The course at once provides an overview of current developments in this emerging field, and asks students to consider many questions about the state of the art. For example, with the new technologies and applications making their way into almost every phase of the economy and rooting themselves in our day to day lives, what can we learn from both the failures and successes? What are the impacts on our society? What is ubiquitous computing, embedded computing, physical computing? How is cyberspace merging with physical space? Class participation, group presentations, and a final paper are required. We have guest speakers each week, and then the following week, a different group of students have to present their reaction to the speaker’s presentation. The reaction can be almost anything – it’s very free form and open-ended. Our group (group #1, lucky us) went today. We were reacting to last week’s guest speaker, poet, artist, designer and all-around genius Vito Acconci. He’s on Wikipedia too. Our group decided to present our new ideas for reinventing public space, making it playful and multifunctional, much like our interpretation of Acconci’s work. In our case, we chose Central Park. The members of the team chose different sites in the park to reinvent. The reservoir was built between 1858 and 1862, based on the design for Central Park by Frederick Law Olmsted and Calvert Vaux. Olmsted is also known for designing Prospect Park in Brooklyn and the Mont Royal Park in Montreal, but more on Olmstead and Vaux later. The reservoir covers 106 acres – 43 hectares (or 1/8th of the park’s total surface area). It is over 40 feet (12.2 meters) deep, and contains over 1 billion gallons (4 million cubic liters) of water. Up until 1993, the reservoir was an active part of the City’s water supply system, and was used as a holding reservoir for distributing water to the City. In 1994, it was renamed after former first lady Jacqueline Kennedy Onassis, who had a 5th avenue apartment overlooking the reservoir and enjoyed jogging around it. Today, it serves a purely decorative function, with joggers and walkers who taking advantage of the 1.58 mile foot path (2.54 kilometers) around it. We brought back some of Jackie’s relatives from the dead and reincarnated them as genetically-engineered robotic cyborg sea creatures. Meet Big Edie and Little Edie, Jackie’s aunt and first cousin. They are the stars of Grey Gardens, a 1975 film that documents their isolated existence in their dilapidated Long Island mansion of the same name. The film made the Edies cult star sensations and gay icons. And now they are immortal fixtures of the Jacqueline Kennedy Onassis reservoir. They definitely add a more mischievous sense of fun, fabulousness and intrigue to the reservoir. And here is Jackie herself. A sea creature of Central Park – Half octopus and half fashion icon. She is New York’s answer to Tokyo’s Godzilla and Scotland’s Nessie, the Loch Ness Monster. Jackie is pretty in pink, so she color coordinates with the cherry blossoms that bloom around the perimeter of the reservoir in spring time. And she’s multifunctional too. She is a tame sea monster. You can ride Jackie. Visitors can get on her tentacles and she will transport you from one end of the reservoir to another. Thus reducing the travel time from one end of the Park to another, and uniting the aquatic space of the reservoir with the terrestrial space of the rest of the park. The Sheep Meadow today is a 15-acre (6 hectare), lush, green meadow for relaxing and enjoying one of New York City’s great skyline views. But the original concept behind the meadow was a little less pastoral. One of the conditions for entries in the 1858 Central Park design competition was the inclusion of a parade ground for military drills but park landscape was perhaps not the best place for military displays. – and may perhaps too totalitarian according to our interpretation of Acconci’s parameters. Frederick Olmsted and Calvert Vaux, who won the design competition, included the parade ground in their design only reluctantly. The Park Commissioners were soon won over to their point of view, however, agreeing that military use conflicted with the vision of a quiet and serene atmosphere. To re-enforce the pastoral and bucolic nature of the “Green” as it was then called a flock of sheep was added in 1864. A sheepfold (a house for sheep) was built in 1870 and twice a day a shepherd would drive the animals to and from the meadow. But in 1934, Robert Moses, the “master planner” of mid-20th century New York banished the sheep to Brooklyn’s Prospect Park and the sheepfold was converted into what is now the famous restaurant Tavern on the Green. Solution: Bring back the sheep. Although the view from the Sheep Meadow is interesting, it can also get a little boring. Many people sunbathe there in good weather, but sunbathing is bad for you. There are a few sheep left in Central Park, but they are in the Central Park zoo’s petting area. This area is small and sad. Set the sheep free! Also, many urbanites are alienated from their source of animal products. They don’t really see or interact with their source of meat or animal fibers. 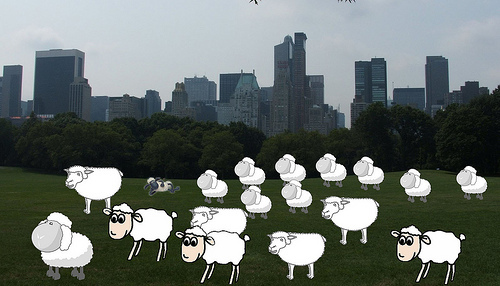 So the new Sheep Meadow with sheep will be multifunctional interactive. There are many different ways that people interact with sheep. We want it to be playful and not be too totalitarian in dictating its use. It will be a real pasture and giant petting zoo. But the sheep will also be raised for meat. This will be organic, free range meat, with a low carbon footprint, suitable for even the most stringent of locavores. The wool can be used to make clothing for the homeless in the winter time. Children can play with their furry friends, and rich Uptown girls can frolic like in rustic setting without leaving the city, much like Marie Antoinette did at her faux-rural private estate on the grounds of Versailles. After the presentation, a couple classmates suggested that I should make some t-shirts with Jackie on them. Click on the image or here to customize and order your own Jackie O shirts. Like the ITP shirt that I designed, I will donate the Zazzle royalties that I make to the ITP student social fund. BTW, I can’t draw good or nuthin’, but I sure had a lotta fun fotoshoppin’ tentaclez onto faces and stuff fo’ this project. And yes, Squidbillies was a definite inspiration.